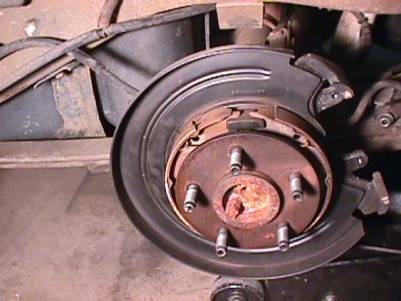 The disc brake conversion described in the article below was performed on a stock 1994 Ford Explorer Sport. Therefore, this article does not take into consideration any modifications or different model years. The most difficult part of this conversion was dealing with the longer left parking brake cable. (A lifted Explorer may benefit from the longer cable because in most cases, a lift kit will need longer parking brake cables). I obtained all the pieces necessary for this conversion from an individual who was planning to install the brakes on a Ford Ranger, therefore, I did not experience removing the disc brake setup from a donor truck. My recommendation would be to make certain to obtain all the pieces necessary for the conversion. If you don’t, you’ll be spending time later trying to hunt down the necessary parts to complete the installation. For additional assistance, consult the diagrams and pictures in a Ford Explorer repair manual. 1) Mounting brackets and backing plates (Right and Left) with mounting bolts (8 total). 2) Calipers (Right and Left). If you decide to go with new calipers (recommended), you’ll need the old ones for cores. 3) Disc brake pads (Right and Left). In some cases, these will be needed for cores. 4) Rubber caliper hoses. (Right and Left). 5) Bolts to secure calipers to mounting brackets (4 total). 6) Steel axle housing brake line with mounting bracket and bolt. 7) Rotors (Right and Left). 8) Parking brake cables (Right and Left) with all attaching hardware, retaining springs, and hangers. 9) Intermediate parking brake cable. 10) Parking brake pedal assembly (optional). 11) Parking brake hardware including: shoes, hold down springs, hold down pins, adjuster screws, return springs, and lever assemblies. Depending upon the year of the donor vehicle, the design for the parking brake mechanism will be different. Note: New shoes are expensive and are not available from aftermarket parts suppliers. Be sure that the shoes have adequate lining thickness, or be prepared to spend around $100 to get a new set from a Ford dealer. 12) New gasket for differential cover. Park the vehicle on a level surface and block the front wheels to prohibit the vehicle from rolling. Raise the rear of the vehicle, support it on jack stands and remove the rear wheels. Also remove the spare tire for more working room. Place an oil pan under the rear differential and remove the ten bolts securing the differential cover and drain the differential fluid. Clean off the old gasket material from both the differential housing and the differential cover. Tip: Wipe down the contact surfaces on both the differential housing and the differential cover with brake cleaner to remove oil from the surfaces. It is absolutely necessary to have a clean surface to prevent the new gasket from leaking in the future. Remove the drum assembly and carefully clean any dirt surrounding the axle shaft seal. Note: Brake cleaner works well for this task. Remove the differential shaft lock bolt and the differential pinion shaft. Note: Rotate the differential slightly in order for the pinion shaft to slide out easier. Press each of the axles towards the center of the vehicle to gain access for the removal of the C-clips. Remove the C-clips with a pair of needle nose pliers. Carefully remove the axles from the housing. Wipe any excess fluid from the shaft with a clean shop towel as the axle is being removed. Remove the steel brake lines from the old drum brake cylinders. Also remove the rubber brake line that connects the housing brake line and the rear brake line feed. Finally, remove the bolt clamp bolt from the top of the differential housing that holds the steel brake line in place and remove the steel brake line from the vehicle. Place a container under the rear brake line feed to catch any fluid that drips out. Disconnect the parking brake cables from the intermediate cable. Remove all springs and plastic connectors that hold the parking brake cables in place. On the passenger side, remove the bolt from the shock mounting plate to remove the bracket. 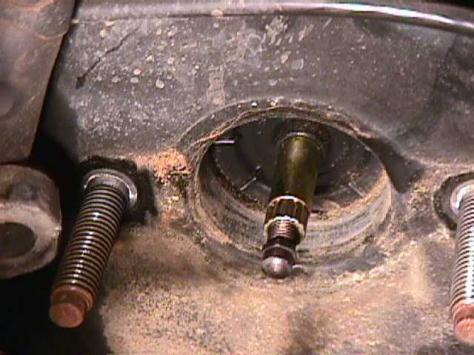 Remove the four backing plate mounting bolts from each side of the vehicle and remove the old drum brake assemblies. Be careful to not get any dirt or debris inside the differential housing. A good tip is to plug the axle tubes with a clean disposable shop towel. Original drum brake setup complete with parking brake cables and steel brake line. Bolt on the new disc brake mounting brackets and backing plates in the opposite manner as the old drum setup was removed. Reassemble the parking brake assembly by attaching the hold down pins, hold down springs, adjuster screws, and return springs to the backing plate. 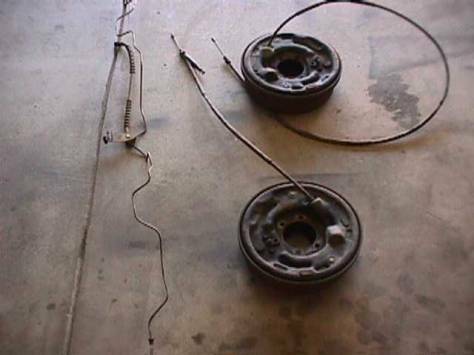 Note: It is easier to do this step with the axles removed from the vehicle. As you can see, it is very difficult to install the parking brake assemblies with the axles installed in the housing. Reinstall the axles into the axle housing and reinstall the axle C-clips, differential pinion shaft and differential shaft lock bolt in the same way as they were removed. Reinstall the differential cover with a new gasket combined with an anaerobic sealer. In my experience, the anaerobic sealer combined with a new gasket provides the best seal. I have found anaerobic sealer only at NAPA auto parts. It’s a little pricey but the results are worth it. Follow the procedure in most repair manuals for the torque sequence of the differential cover. Install the rotors over the axle and parking brake assemblies. Make sure to have the rotors turned before they are installed. Even if a donor truck has very low miles, such as my case, the rotors can become very badly warped. If the rotors are brand new, I would still have them turned. In other words, make sure the rotors are true before installing them on the vehicle. Install the caliper assemblies with pads onto the mounting brackets. Tighten the two bolts that hold the caliper in place on each side of the vehicle. Be sure not to over tighten these bolts, they can be broken easily if not careful. Attach the rubber caliper brake lines to the calipers. Attach the rubber brake hose from the left caliper hose to the main brake line feed. Attach the steel housing brake line to each caliper and replace the mounting bolt that secures the bracket on top of the differential housing. Note: The 95 and newer axle housings have a mount to secure the rubber caliper hose, however the 94 and earlier housings do not have this mount. In this situation, I cut a piece of strap steel about 2 inches, drilled an offset hole, and tacked welded this mounting bracket to the axle spring perch. From here I was able to secure the rubber caliper hose. See the picture below. The steel strap can be obtained from most hardware stores. If you do not have access to a welder, an exhaust shop can tack weld the bracket on later. Attach the disc brake parking brake cables to mounting brackets and attach the end of the cable to the parking brake levers. Finish mounting the cables to the original locations using the original hardware. Attach the intermediate parking brake cable. Double check all brake line connections to ensure they are tight. Install the tire and wheels. Before lowering the vehicle, adjust the parking brakes by inserting a flat-headed screwdriver into the adjuster hole on the backside of the mounting plate. Rotate the screw to spread the parking brake shoes. Be sure not to spread the shoes too far causing the parking brake to be too tight. Lower the vehicle off of the jack stands. Fill the master cylinder with new brake fluid. Bleed all four brakes, starting with the one furthest from the master cylinder working towards the closest. (Right rear, left rear, right front, left front). Be absolutely certain that the fluid level of the master cylinder does not get too low. After the brakes have been bled, remove the 9/16 nuts that mount the master cylinder to the power brake booster. (Do NOT loosen any brake lines). This will expose the pushrod for the master cylinder. In order to maintain a good pedal feel after the conversion, the rod must be adjusted to push further into the master cylinder. With the closed end of a 9mm box wrench, hold the pushrod, and with a 7mm box wrench adjust the nut on the end of the pushrod. This procedure is trial and error and will require you to test drive the vehicle in order to get a desired pedal feel. See picture below. The braking power on the new disc brake setup is very impressive. I’m estimating a 50% increase in braking power over a stock setup. This is with carbon metallic front pads and rear disc brakes. Brakes are not an item on your vehicle to be overlooked! 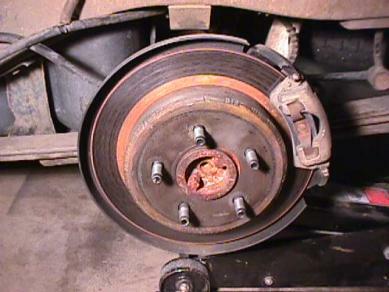 Be sure to recheck all brake lines for leaks after the conversion is complete as well as readjust the parking brakes after about 500 miles of driving. I also found it necessary to readjust the master cylinder pushrod after about 1000 miles of driving. for use at your own risk and discretion. What good is alot of power if you don't have the brakes to bring those horses to a hault? Don't skimp on brakes, come to AmericanTrucks and get quality set of Ford truck brakes to match that powerful engine.